I completed a bachelor’s degree in Business Administration from the Universidad Católica Boliviana San Pablo in Bolivia. After this, I worked as the Marketing Manager of the De Licor Supermarket in La Paz, Bolivia. Here, I was responsible for negotiating deals with our suppliers, taking charge of our Christmas campaign, designing and implementing store decorations as well as social media publicity. I also managed our contracts with local models who promoted the shop’s products. For me it was a multicultural environment, work opportunities and a good ranking. All of which were offered by NBS. In my last job I learned how to work with social media but I wanted in-depth knowledge about the digital world. In addition, I always wanted to study abroad and winning a Postgraduate Scholarship with NBS gave me the opportunity. I would also say that I chose NTU as it is ranked in the Top 50 UK universities in the marketing field. Why did you choose to study MSc Digital Marketing and what did you enjoy about it? As I mentioned before I wanted to know more about digital marketing as it’s the newest and most developing field in marketing. Additionally, I found the MSc Digital Marketing modules very appealing compared with the other universities I considered. What I really enjoyed about the degree was working with people from all over the world, (I had never done this before) and had so many opportunities to attend workshops and activities organised by NBS. I also enjoyed that NBS made us of the latest technology and the library even has facilities to rent a computer. Is there anything that stood out on your course which wasn’t offered anywhere else you considered? The work experience and the Major Project in the final semester which you can choose. I did not find these options in other universities as a lot make you do a thesis. In addition, Nottingham is the perfect student city. The main difference was that NBS fostered an environment in its seminars that encourage interaction between students and professors. Initially, I found this quite challenging but I found that it prepares you for the real world. What was your Major Project choice and what did you do for it? 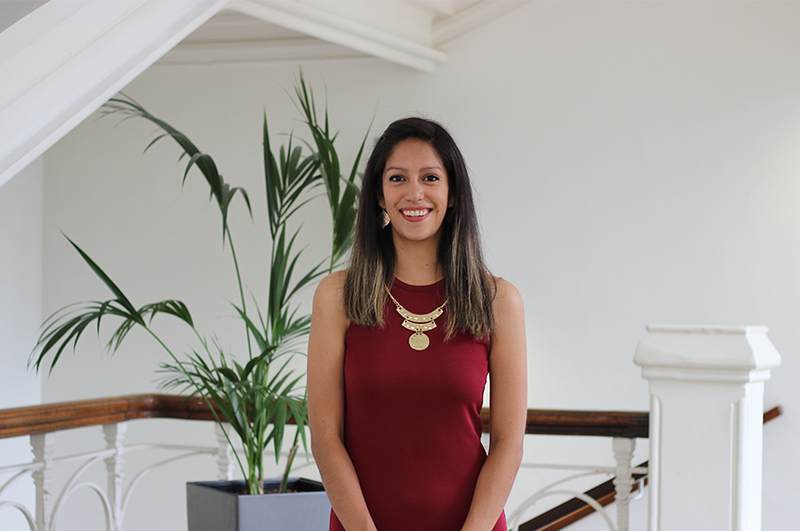 I chose the Internship Experience Project because I wanted to get more practical experience working in the digital world as well as a better understanding on how companies in different countries operate. For my internship I worked at a local Nottingham Business called Boom Online for 7 weeks. As part of the internship, I was tasked with researching e-commerce businesses in order to target specific companies to boost Boom’s data collection services. In addition, I made recommendations to my manager on how the company could improve its CRM system. Finally I was asked to create a detailed flowchart for company employees which facilitated the efficient use of Boom’s CRM system. Critical thinking, writing skills and much improved English language skills! The main difference is that during my bachelor’s degree, I never had to relate theory into practice. I simply was tested on it in exams. At NBS, I had to apply theory to practical situations, such as in my internship or in a case study and to critically evaluate everything. It already consider myself more competitive with the MSc Digital Marketing master’s degree. Furthermore, the opportunity to study abroad in England whilst achieving good grades will really help me to stand out in the job market. I believe the degree will help me to find better opportunities in my country. The degree not only gave me the knowledge, but it gave a different way of thinking and the international exposure into how companies operate. Hopefully I will be able to start my own business in the near future. I was involved in quite a few! I really enjoyed the Thinkubator challenge, I was involved in the student mentor scheme and attended workshops on developing critical thinking, writing and communication skills. During my degree, I also had the opportunity to work for NTU’s International Office for a week as their Social Media Ambassador. I was in charge of the university's Instagram account and my objective was to show people what it was like to be a student in Nottingham. I had to send between two or three pictures a day taken by myself to encourage people to study, live or simply visit Nottingham. I have to say that it was one of the most exciting opportunities to show others my point of view as an NTU student whilst also being able apply my digital marketing master’s knowledge to it! I really like it! The people are very nice and helpful, especially when you are an international student. I learned how to behave and communicate according to local customs in order to make good connections with people. In addition, I improved my English to a level I never imagined I would thanks to my student mentor and the In-Sessional English classes. My experience at NBS has influenced to change career path. I am now focussing on starting my own digital marketing business. The combination of the internship, theory and practical application of the module concepts have made me realize that digital marketing is the future and companies need it in order to be successful. Finally, in your words, how would you describe your experience of studying a master’s degree at NBS? It was the best experience I had! Not only was I able to learn more about digital marketing, but I also got to know wonderful people; both my classmates and module professors.